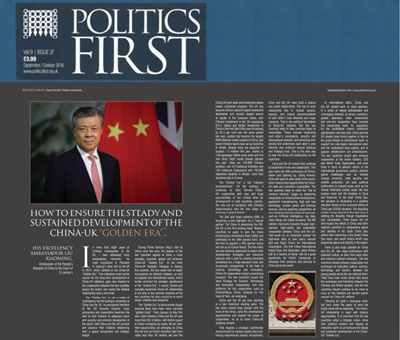 The Politics First Magazine Published A Signed Article by Ambassador Liu Xiaoming Entitled How to Ensure the Steady and Sustained Development of the China-UK "Golden Era"
In more than eight years as Chinese Ambassador to the UK, I witnessed many extraordinary moments. The most impressive is President Xi Jinping's state visit to the UK in 2015, which ushered in the China-UK “Golden Era”. This milestone event set the course for the long-term development of China-UK relations, gave new impetus to the cooperation between the two countries across the board, and raised the bilateral relationship onto a new level. The “Golden Era” is not a matter of contingency but the strategic consensus of China and the UK. As permanent members of the UN Security Council, major economies and responsible countries who take as their mission to safeguard peace and security and promote development in the world, both China and the UK perceive and advance their bilateral relationship from a global perspective and strategic height. During Prime Minister May’s visit to China early this year, the leaders of the two countries agreed to build a more strategic, practical, global and inclusive China-UK “Golden Era”. At the ninth China-UK Strategic Dialogue in Beijing this summer, the two sides had in-depth discussions on bilateral relations, as well as regional and international issues, which further enriched the strategic significance of the “Golden Era”. A sound, vibrant and mutually-beneficial China-UK relationship is not only in the common interests of the two countries but also conducive to world peace, stability and prosperity. The “Golden Era” is not an empty slogan because there have been many concrete “golden fruits”. From January to May this year, trade between China and the UK was more than $32.4 billion, with British export to China increasing by nearly 30 per cent. New opportunities are emerging as China lifts the ban on British boneless beef from cattle less than 30 months old and the China-UK joint trade and investment review makes scheduled progress. The UK has become China’s second largest investment destination and second largest source of capital in the European Union, with Chinese investment in the UK surpassing $19.2 billion and British investment in China in the first half of this year increasing by 82.5% over the same period last year. London has become the largest RMB offshore market outside China, and seven Chinese banks have set up branches in Britain. Mutual visits are expected to surpass 1.5 million this year, thanks to 150 passenger flights every week and five new direct flight routes already opened this year. There are 170,000 Chinese students, and 29 Confucius Institutes and 156 Confucius Classrooms with 160,000 registered students in Britain, more than anywhere else in Europe. The “Golden Era” is not “mission accomplished”. On the contrary, it continues to drive forward China-UK cooperation with new and huge opportunities at the critical time for development in both countries, namely, the new era of socialism with Chinese characteristics and the new stage for building a “global Britain”. The Belt and Road Initiative (BRI) is becoming a new highlight. As a “natural partner” for China in advancing the BRI, the UK is the first among major Western countries to apply to join the Asian Infrastructure Investment Bank (AIIB) and contribute to the AIIB special fund, and the first to appoint a BRI special envoy and set up an Expert Board. The two sides are also working vigorously to match their development strategies and industrial policies with a view to creating favorable conditions for a high-standard trade and investment arrangement. In the field of science, technology and innovation, China-UK cooperation enjoys a promising prospect. The two countries issued the Joint Strategy for Science, Technology and Innovation Cooperation and new platforms for this cooperation, such as Pitch@Palace China initiated by The Duke of York, are emerging. China and the UK are now standing at a new historical starting point. The two sides should keep abreast with the trend of the times, seize the development opportunities and expand the scope of cooperation, so as to move China-UK relations forward. That requires a strategic partnership characterised by mutual respect and trust. Having experienced various vicissitudes, China and the UK have built a mature and stable relationship. The key to such relationship lies in mutual respect, equality, and mutual accommodation of each other's core interests and major concerns. This is the political foundation of China-UK relations that the two countries need to take concrete steps to consolidate. These include respecting each other's sovereignty, security and development interests, and refraining from actions that undermine each other's core interests and undercut mutual political and strategic trust. That is the only way to keep the Chian-UK relationship on the right track. China and the UK should also continue to be partners in win-win cooperation. This year marks the 40th anniversary of China’s reform and opening up. Going forward, China will open its door wider to the world, which means more opportunities for China-UK trade and economic cooperation. The two countries need to make the “pie of common interests” bigger by deepening cooperation on infrastructure development, equipment manufacturing, high and new technology, nuclear power and financial services, and by exploring cooperation on new industries and new modes of business, such as artificial intelligence, big data, clean energy and digital economy. The BRI calls for more early harvests through high-standard, high-quality and sustainable cooperation between China and the UK. That could be an important subject for high-level talks at next year’s second Belt and Road Forum for International Cooperation. The first China International Import Expo in November, where Britain will be a country of honor, will be a great opportunity for British companies to showcase their products and services to China and to the world. In international affairs, China and the UK should work as close partners. In a world of deeper globalisation and converging interests of various countries, greater openness, better connectivity and win-win cooperation have become the overarching trend. As supporters for the multilateral system, economic globalisation and free trade, China and the UK should stand firmly together in face of the grave threats to international trade, to support the rule-based international order and the multilateral trade regime, and to oppose unilateralism and protectionism. The two countries should also enhance cooperation at the United Nations, G20 and World Trade Organisation, and work hand in hand to advance reform in the international governance system, address global challenges such as climate change, terrorism, cyber security and wildlife protection, and seek political settlements to hotspot issues such as the Korean Peninsula nuclear issue, the Iran nuclear issue and the situation in Syria and Myanmar. In the South China Sea, the situation is developing in a positive direction thanks to the concerted efforts of China and ASEAN countries. The disputing parties having returned to the right track of settling the disputes through negotiation and consultation. China hopes the UK will respect the efforts of China and other regional countries in safeguarding peace and stability in the South China Sea, refrain from interfering in the South China Sea issue and avoid actions that may jeopardise peace and stability in the region. There is also huge potential for China and the UK, two major civilizations with splendid culture, to learn from each other and enhance cultural exchanges. The two countries should enhance cooperation and exchanges on education, culture, science, technology and tourism, between the young people and at the sub-national level. There have been many stories told about the exchanges and friendship between the Chinese and British people, and the two countries should continue to do more to carry on this tradition and cement public support for China-UK relations. “Panning for gold is strenuous work, but from under the grains of sand the bright shine will be rewarding”. The China-UK relationship is faced with historic opportunities. It is important that the two countries adopt a strategic vision, show their political wisdom and display an innovative spirit so as to ensure the steady and sustained development of the China-UK “Golden Era”.